mother & daughter team. 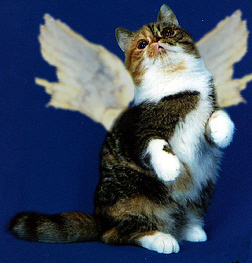 Our cats are shown by us in the U.S.
years and in 1998 we have became members of ACFA and TICA. name? Agape is a Greek word for love, Christian love and the love of the Lord. The word Agape is the foundation/basis of all other forms of love, that of friends, that of man & woman, mother's love. All love must begin with Agape. Willow is simply the tree that weathers storms. Storms that might break and splinter the great oak & ash. Our kittens are all birthed/delivered by us and they are handled with love from the moment of birth to the time they leave us. Our Double Pajean cats are grandsons & granddaughters of GRC Pajean Edwin Edwards. 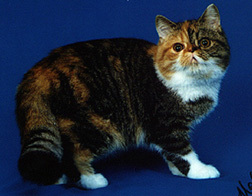 We can also do "specialty breedings" for kittens. Our cats & kittens have both the "wide-open sweet look" , & the "Extreme" look, with huge eyes. The willow may bend nearly in half with the burden of the storm, but when the storm has passed, the willow stands proud and strong. Her graceful limbs swaying & firm, reaching out to those around her, whom might need her touch of strength. 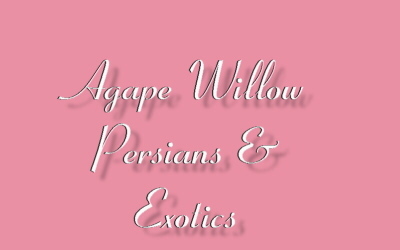 So, the name of our Cattery goes deep within us, for with Agape love, and the strength of the willow, no dream or goal is too large to reach. Like Joseph's coat, we too have many colors. Bi-colors, parties, brown tabbies & solids, & whites. We've had our cattery for over 6 years. We are a cattery without cages. We've only been showing since November 1996, and we have a number of champions. We're looking forward to a "GRAND" future! Our bloodlines include Pajean, Marhei, Anz, South Paw, Bolo, Larkhill & Caliope, W-Ali-Baba , and other top United States and Canadian catteries.